We find crochet blanket patterns almost impossible to resist. As well as being perfect for those days when you're in the mood to get stuck into a big project, they come in so many different styles. Our online store stocks everything from granny square designs - traditional and modern - to patchwork, plain and even spotty crochet blanket patterns. Love elegant old fashioned styling? Our Vintage Lace Blanket Crochet Pattern is ideal for anyone with an intermediate level of crocheting ability. Great for adding a touch of traditional style to your bedroom, the design dates all the way back to 1952 when it was featured in the 5 July issue of Woman's Weekly. We suggest making the pattern using two balls of Egyptian Cotton - it'll give your make a luxurious finish. 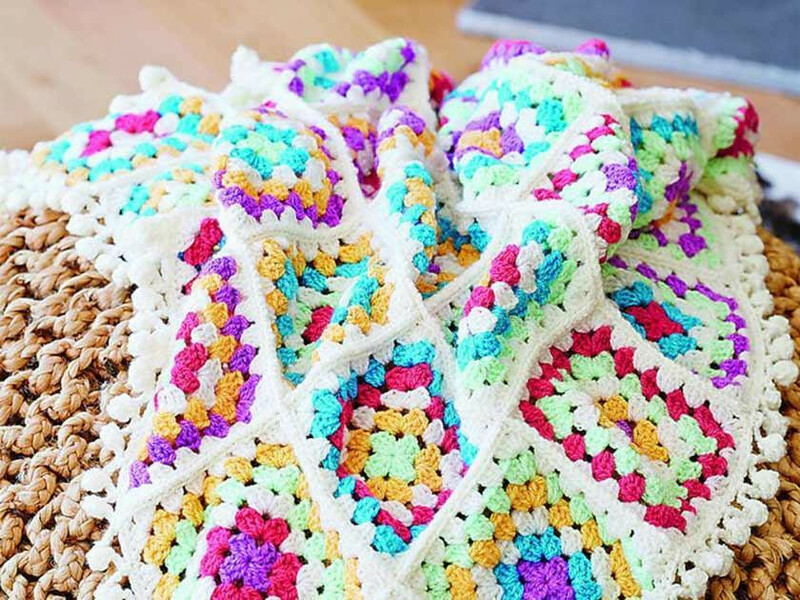 Alternatively, if you're looking to bring a bright splash of colour to your surroundings, look no further than the Granny Square Blanket With PomPoms Crochet Pattern. Not only is it eye-catching and fun to make, it'll come in handy on chilly days when you fancy chilling out on the sofa for a movie marathon with a bowl of popcorn. For something just as chic but a little more subtle, our Patchwork Blanket Crochet Pattern is a great choice. Measuring approximately 95 x 73cm once complete, the throw looks wonderful when crocheted in neutral shades such as cream, grey, brown and white. And of course no round-up of crochet blanket patterns would be complete without a snuggly shawl for a tiny tot. The Baby Lamb And Blanket Crochet Patterns pair is great for beginners or anyone looking for a quick and easy make. We've no doubt that the dinky stuffed sheep will become one of the little one's favourite toys too. Shop our entire range of the crochet blanket patterns now.